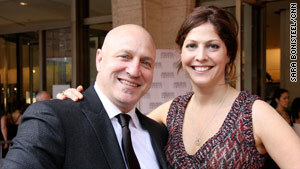 Tom Colicchio and his wife, Lori Silverbush, at the James Beard Awards. He says giggles are OK: "Relax. You're here to have a good time"
New York (CNN) -- TV's "Top Chef" is now the top chef in the U.S., and he wants you to eat at his restaurant -- no silver spoon required. Tom Colicchio won the Outstanding Chef Award at Monday night's James Beard Awards at Avery Fisher Hall in New York. While he's glad of the nod, he's well aware that many people think it means his restaurants are now out of their league. Colicchio is the owner of Craft, Craftsteak, the 'Wichcraft sandwich chain, and the recently opened Colicchio & Sons, and host of the "Top Chef" program on Bravo. He and Beard's Best Service Award winner, Grant Achatz of Chicago's Alinea, agree that while fine dining may be pricey -- it's often roughly the cost of concert or sports tickets -- it's also a chance to have the experience of a lifetime. And it's their business to make diners feel welcome. "Most of the better restaurants out there -- even if they're high-end -- are usually not snobby and pretentious. It's the restaurants that are trying to be like that that get it wrong! The root of dining and hospitality is taking care of people," Colicchio told CNN. "People go to high-end restaurants and expect it to be snobby. They get their hackles up. They see a waiter talking to another waiter, sharing a joke, and think they're being laughed at. Come on. That's not the case." "In New York, [waiters are] writers, dancers and painters. They don't have money to go to fine-dining fancy restaurants! They're not from some highfalutin' background and going to look down at you. They're working-class people -- like everyone in restaurants." And while you'll never leave his restaurants hungry, don't go expecting to have to loosen your belt too much. But do "expect to be really taken care of. When food costs more, the restaurant can afford to have more staff on the floor." "Things you need to keep in mind going to an upscale restaurant are that the price you're paying is not for a lot of food. It's for high-quality food. It's a very different dining experience than if you're going to a chain restaurant where they're piling it on." "I was reading a book called 'The Zen Guitarist,' which essentially said that too much food on a plate is wasteful and unappetizing and it's the role of the chef to deliver the right portion of food." Colicchio adds, "Do a tiny bit of research. Go online and see what they have to offer. If you're intimidated by the menu, that's when you really need to use the waiter." His most important bit of advice for diners: "Be nice. It goes a long way. You don't need to palm a maitre d' with a tip at the door to get a good table. If you walk up and say, 'This is a special occasion -- my wife and I are having our first anniversary,' they'll take care of you." At Chicago's Alinea -- which was ranked in 7th place on a recently released list of the world's top 50 restaurants -- diners will never have to wonder if they're using the right salad fork -- or any fork at all. Chef Grant Achatz is known for serving highly inventive dishes involving elements like scented air, temperature contrasts and custom-made utensils that sometimes require eating instructions from the wait staff, and he's well aware that many diners are outside of their comfort zone. "Because of the nature of the cuisine -- it being challenging because of the manipulations of ingredients and the way it's presented -- we have to counteract that with very approachable service," he told CNN. "Unlike a lot of four-star restaurants in the past that [have] scripts for describing the dishes and everyone has to cut their hair the same -- all the connotations of the snooty French waiter -- we intentionally abandoned. We encourage our staff to let their personality shine through, because that's real hospitality. It's about making people feel comfortable and welcome." Achatz is aware that he's likely to encounter skeptics with his unusual approach to dining, but he and his staff are up to the challenge. "Some people walk through the door, ready to let us take them on a journey. With some people, it takes a course or two to build up that trust -- through the food or the service team letting them know it's OK to laugh out loud. It's OK to giggle and smile," he said. And diners do. Blogs and websites abound with stories of patrons weeping, moaning and screaming with surprise and delight most nights of the week. His advice to diners: Come with an open mind. And he'll do his part to help. Said Achatz, "When we opened nearly five years ago, there was so much hype and buzz and people saying they were worried they weren't going to 'get it.' We decided to combat that." "The very first bite that everyone had was, literally, peanut butter and jelly. We're going to give you something everyone had at some point in their life. It doesn't look anything like a peanut butter and jelly, but it will taste like one. That's going to set the tone, and people are going to laugh, and everything is OK after that. In a way we were making fun of ourselves." And if the chef and staff can have a ball, so can the customers. Said Achatz, "Relax. You're here to have a good time."